If you have lost one or more teeth, you need a quality tooth replacement to enjoy full smile confidence once again. Dr. George Michaels places and restores dental implants from the comfort of our Midcity Dentistry office. The procedure is completed over the course of six months to a year — and once it’s finished, patients enjoy the very best in tooth replacement. Midtown Atlanta friends and neighbors are invited to learn more about our dental implant services and request an appointment today. 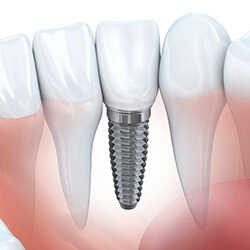 The dental implant procedure is completed in two phases: implantation and restoration. A recovery period of four to six months is necessary for healing of the dental implants in between each phase. Many dentists refer patients out of the office for the placement of dental implants, but Dr. Michaels handles each step of the dental implant procedure from the office where you already feel relaxed and at-ease. Dental implant placement requires extreme precision. Dr. Michaels will examine where your teeth have gone missing, the health of your jawbone, and the state of the surrounding teeth to put together your treatment plan. Patients should be in solid oral and overall health to undergo the dental implant procedure. It is not unusual for preliminary bone grafting procedures to be required for the successful anchoring of the dental implants. Once each dental implant has healed together with the jawbone, you return to Midcity Dentistry for the final restoration, when the prosthetic tooth/teeth are affixed to the implant(s). 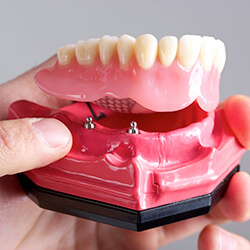 Dental implants can support a single dental crown, a fixed or removable bridge, or a full denture. Prosthetics made of dental porcelain, ceramic, or zirconia provide the most natural-looking solution. Implant-retained prosthetics offer increased stability, and will not need to be replaced often like non-implant retained tooth replacements. 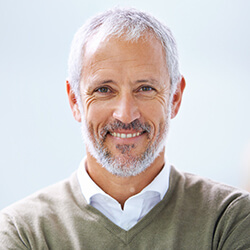 With the help of sturdy dental implants, patients can eat what they please, speak without lisps or whistles, and smile with complete confidence.